After dipping the shapes – circles, cubes, pyramids and more – into soapy water, drag the shape through the air to try creating a shape bubble. A pattern emerges: the soap film suspended in the frames always occupies the minimum possible area, a sphere. 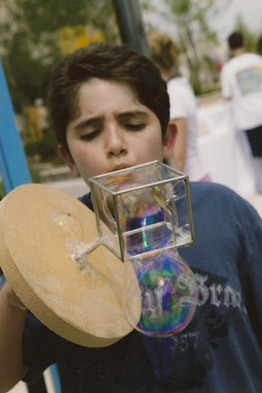 The design of the bubble exhibits consists of small hand-held bubble wands. A bubble exists because the surface layer of a liquid has a certain amount of tension which causes the layer to behave like an elastic sheet. Soap actually acts as a stabilizing element to water and allows for the creation of bubbles. As the soap film stretches, the surface concentration of soap decreases, which causes the surface tension to increase. The bubble automatically forms the shape of a sphere because this shape has the least surface area for a given volume. Soap acts as thin film that interferes with the light. However, the soap bubble itself is of varying thickness. Depending on the thickness of the film, bubbles may appear different colors as light hits them. Notice that the bubble changes color when viewed from different angles. This is the property of iridescence. This may also be noticed in butterfly wings.